Jiang Xinlai has been the Assistant Principal Double Bass of the Hong Kong Philharmonic Orchestra since 1997. 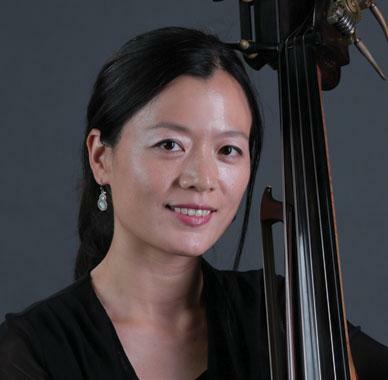 A native of Shanghai, Jiang started her double bass studies at the age of ten after playing the violin for four years. She gave her debut double bass recital at the age of 15 while she was studying with Cao Jian at the high school of the Shanghai Conservatory. In 1994, Jiang went to the USA to pursue her Bachelor's Degree at the New England Conservatory of Music, where she studied with Lawrence Wolfe and earned her place in the National Dean's List. In 1996, she won First Prize in the conservatory's string competition, and transferred to the Juilliard School, studying with Orin O'Brien. Jiang has performed at various music festivals and has toured several countries. In 1994, she was among the first Chinese musicians to participate in the Asian Youth Orchestra. During the summer of 1995, she toured Japan with the Pacific Music Festival, as well as Chile and Argentina with the New England Conservatory Youth Philharmonic Orchestra. In the following two years, Jiang was a fellow at the Tanglewood Music Center and at the National Orchestra Institute, both in the United States. The summer of 2000 brought an invitation to play in the chamber orchestra of the International Laureates Music Festival in Los Angeles.